Our family-owned company has been providing commercial dishwashing machines and industrial cleaning supplies to our clients in Pennsylvania, Delaware and New Jersey since 1963. How does our family-owned business compete with international conglomerates? 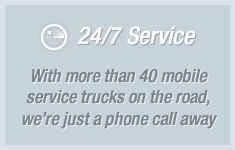 By providing unbeatable service. We pride ourselves on meeting the unique needs of our clients quickly and at a reasonable price. And when it comes to service, “tomorrow” is not in our vocabulary. Not only do we rent and sell commercial dishwashers, we also provide reliable and affordable maintenance, parts and repairs. We also provide laundry products (including green laundry products) and commercial cleaning supplies. If you’re operating a full-service or quick-service restaurant, hotel, cafeteria, or hospital food service kitchen, Termac can help. Contact Termac to learn more.